Every artist must start somewhere and usually we start looking up to somebody. Our favourite artists inspire us with they creativity and spark our own. That’s why this month the theme of our challenge is Favourite Artist. So, who is it? Who inspires you? 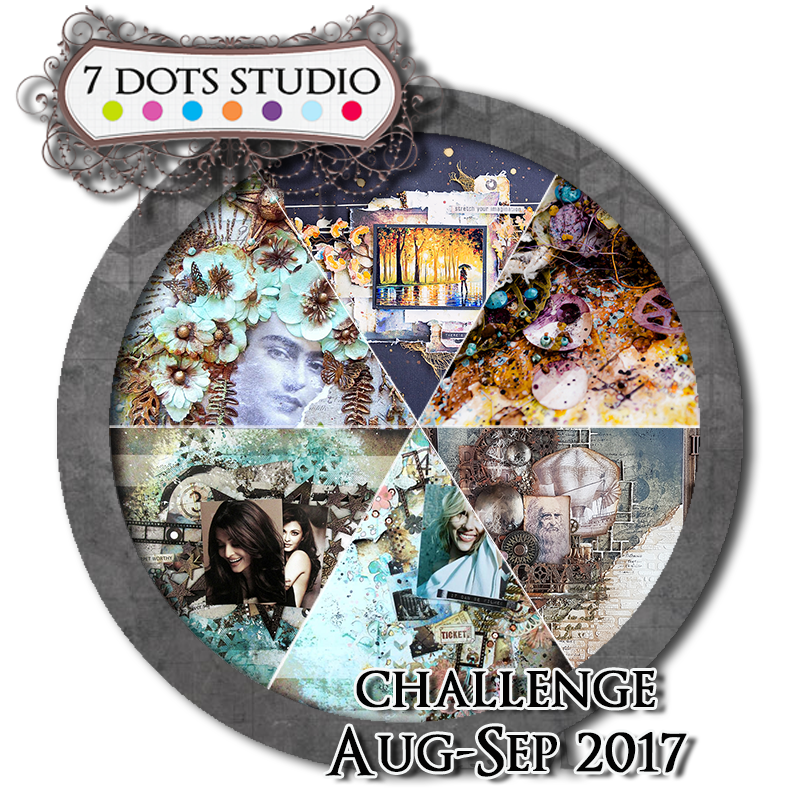 Make any scrapbooking project about your favourite craftsperson using 7 Dots Studio products and share it with us in the August Challenge. 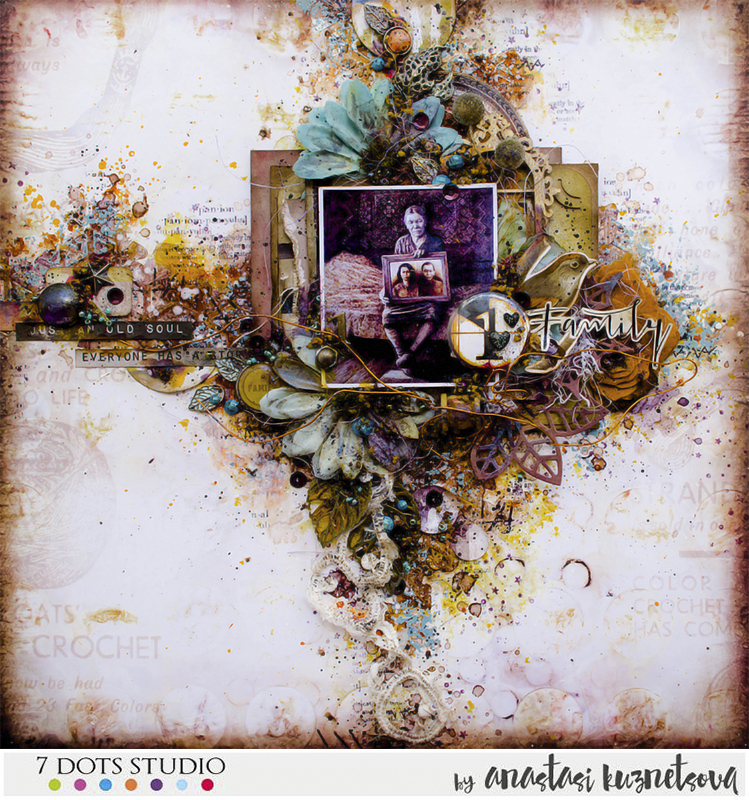 This month’s theme at 7 Dots Studio is “Favourite Artist” and I created a mixed media collage project about one of my favourite artists: Frida Kahlo. I’ve always admired her courage as an independent woman who despite her physical and emotional pain she was able to succeed as an artist in a male dominant society. 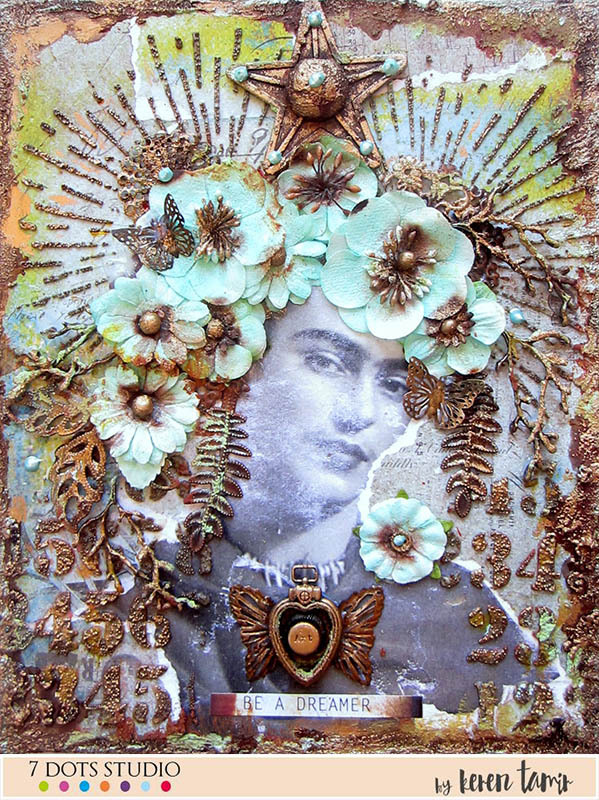 I call this piece Ode to Frida Kahlo and I used a gel transfer technique for her face. 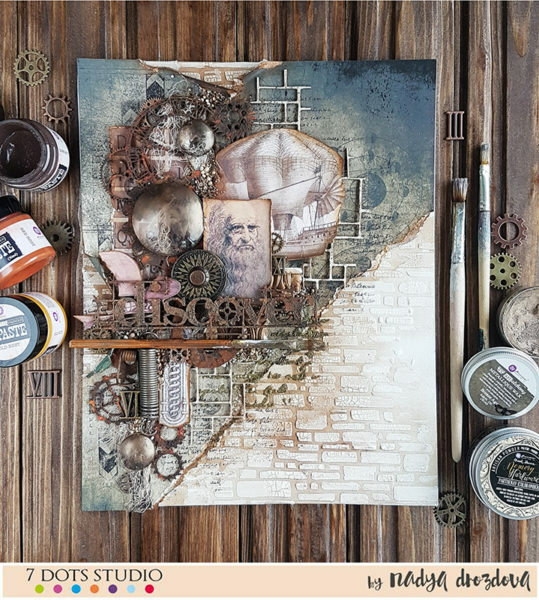 Then I used rust and patina paste to alter it. 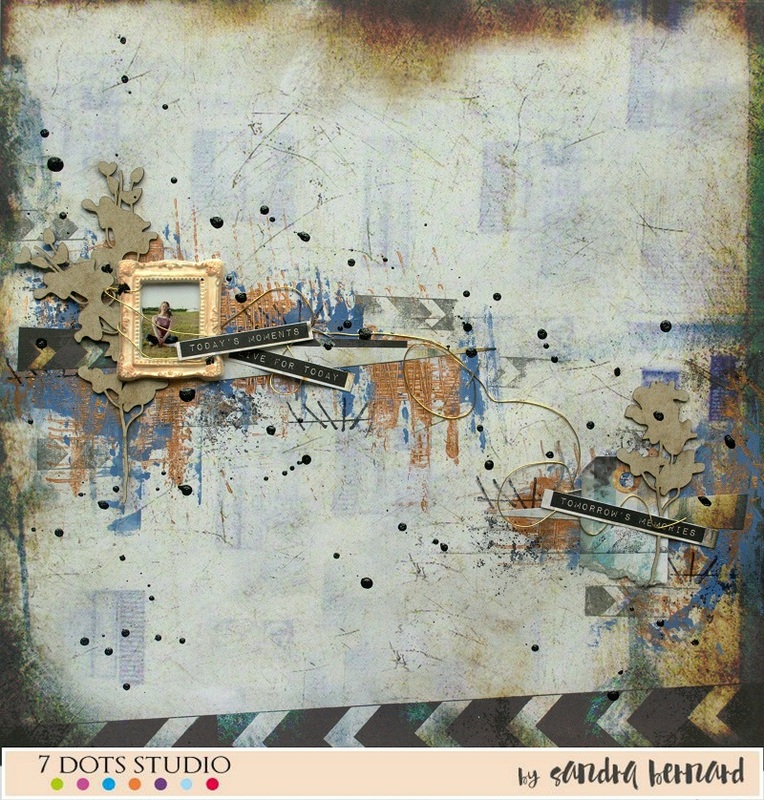 I also used the Hazy Days collection for the background. Watch my video tutorial above to see how I created it. I choose Franz Marc as my favorite artist. This oil painting he created in 1912 (Little Yellow Horses) is one of my favourite paintings ever in the history of art. Franz Marc has been an inspiration for me since I was a teenager. I love the expressionistic peroid in the history of art, with the bright colors and the way they started painting more and more abstract. This is one of my favorite periods, and Franz marc was inspired by lots of other artist who are also on my fav list. I decided to use oil pastels to recreate this painting. I used the paper from Dreamscapes ‘Narwhal’ to draw the horses on, and I glued it down on the paper from Hazy Days ‘Twilight’. I wanted to create the background differently, so I used stamps, stencils and word stickers to come to a similar composition. This piece of art is titled ‘Bewitched Park’ by Leonid Efremov. He is my favourite artist at the moment. I enjoy his bright, and vivid style. He paints with oil paints and only a palette knife. 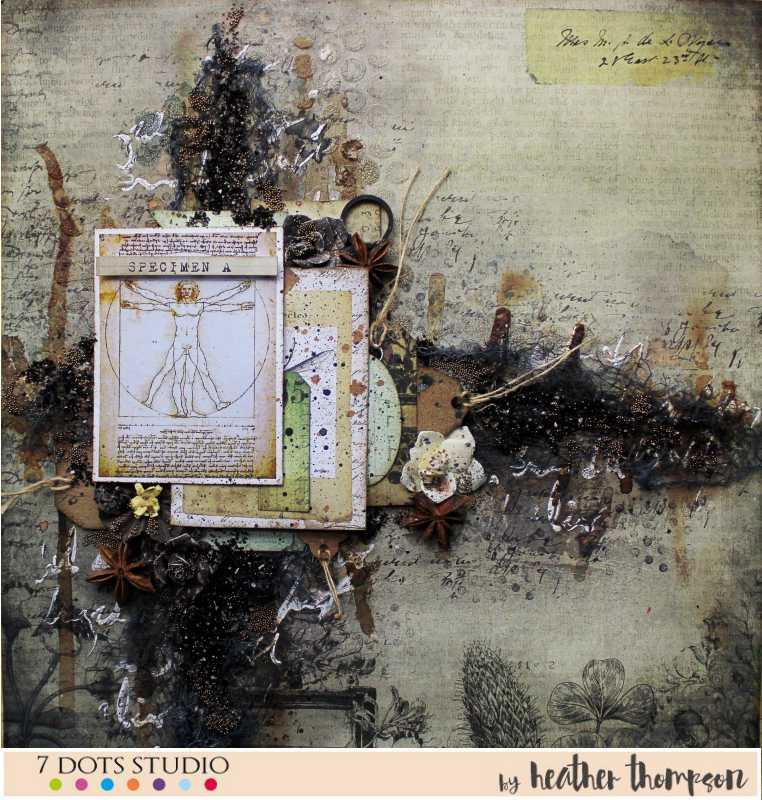 His art has inspired my layout. 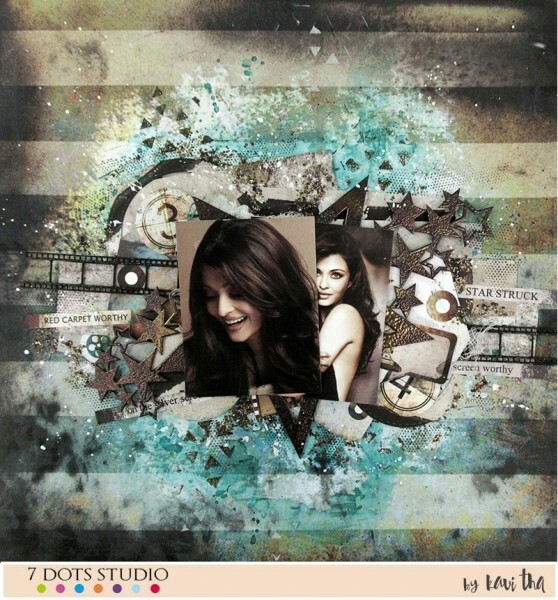 I created layout with one of my favorite Actresses Scarlett Johansson. I just love movies with her participation! I think she is very talented and her roles are always memorable! 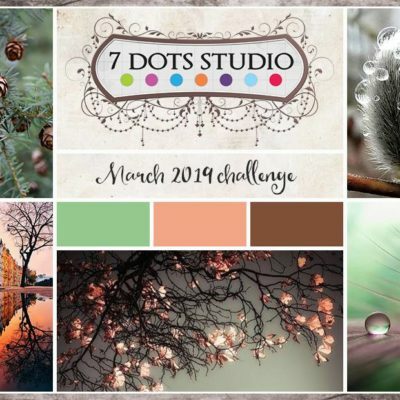 This month’s the challenge at 7 Dots Studio is Your Favourite Artist. Well there are so many to choose from, I had to narrow it down to someone who called to me, who had some of the same interests as me, and why not do Leonardo da Vinci. He was not only famous for the Mona Lisa but he desire to explore and under stand the human body as portrayed in the Vitruvian Man. His desire to learn and understand anatomy and physiology intrigues me. His talent not only an artist but scientist and botanist, although never truly considered a scientist, all of those subjects that interest me. So I hope you enjoy my “Specimen A” of the Vitruvian Man. For this months challenge Louise has created a 6 x 12 layout about one of her favourite artists, or more so one of her favourite group of artists; ‘Street Artists’. 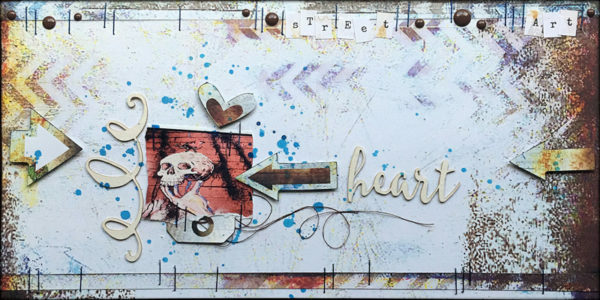 Louise just loves Urban street art, and especially loved all of the street art she saw when she travelled to NYC. This particular photo is of some street art from Brooklyn NY. One person immediately came to my mind for this challenge is “Aishwarya Rai”. Former Miss world and a great actress,a best example for beauty with brains. Even after two decades of winning the title, she is still popular and successful, the way she carries herself with dignity is something commendable. My childhood favourite and a role model to every women out there. Most recently, I got acquainted with the work of the Yakut artist Andrei Chikachev. I really liked his paintings, they are about life, about nature. And one picture has sunk into my soul especially. It is called “Widow”. I was very touched by the old woman, pictured on it. And very surprised and delighted the artist’s desire to capture this episode from the life of this particular woman. For my work, I chose a piece of paper from the old collection “Domestic Goddess”. 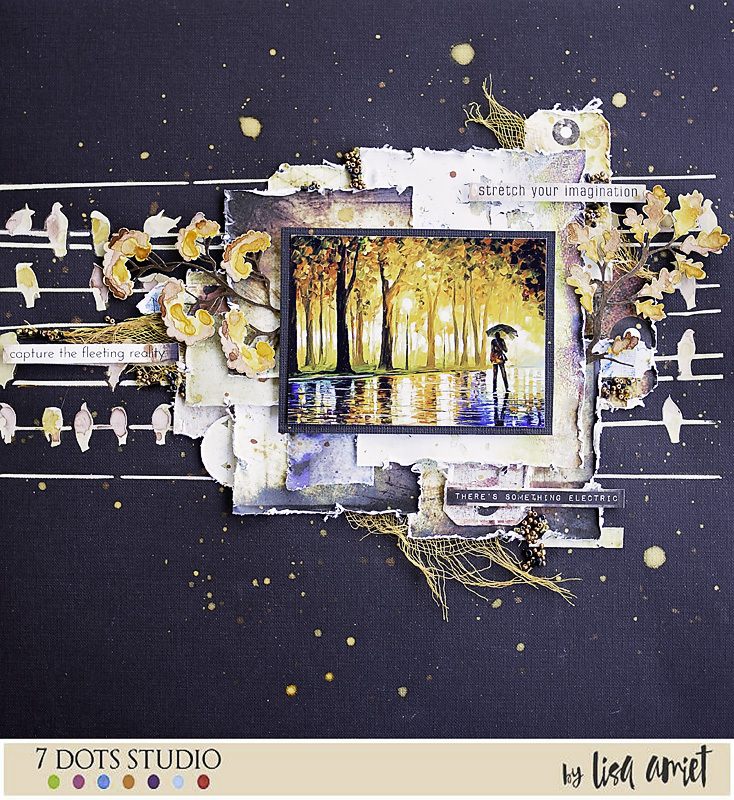 With a background perfectly with the new collection “Dreamscapes”. 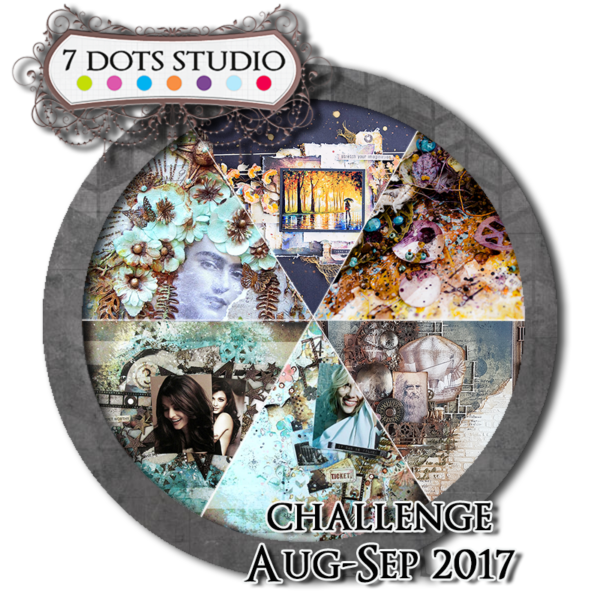 Challenge is open till September, 19th midnight CET. We announce winners by the end of the September.